As everybody knows speed of the site matters a lot in the today’s world. Speed is a quality that all the websites or services should maintain, and thus WordPress is not an exception. You always have to keep in mind that the first impression is the last impression, so it is important to ensure you that in no way the visitors will leave your site with any reason. You don’t have to leave any reason on your site from which you lost your visitors. You only have to focus on turning the visitor into customer. 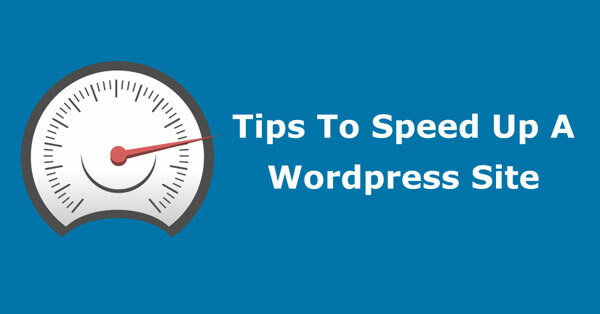 In this post, I am going to show you how effectively you can improve your WordPress site loading speed and also with this you can improve the performance. Your choice of web host bigly affects your webpage speed. A good web host is the establishment where your site runs, it’s the first angle to be tended to when taking a shot at improving webpage speed (regardless of the fact that not a WordPress powered website). A Content Delivery Network or Content Distribution Network (CDN) is a system of distributed servers that deliver the web pages and other web resources to the user those are based on his or her geographical location. Caching is the temporary storage of content such as pages, images and any other files that has been used to deliver your page. All this content is saved on the visitor’s local drive as a cache, so that whenever they are requested again by the same visitors, they delivered much faster. Caching also happens on the server. It is basically a technical area, but there are several popular WordPress plugins that you to configure and manage caching very easily. The best plugins for this purpose are W3 Total Cache and WP Super Cache. WordPress usually auto saves almost everything. This includes the unwanted revisions, trackbacks, pingbacks, trashed items, unapproved comments, or comments marked as spam, etc. Indicating post portions and minimizing the quantity of widgets and posts in a page is an excellent approach to keep your homepage optimized. In this I have covered the best approaches that help you in speed up your WordPress website. Implementation of these methods will greatly improve your WordPress site loading speed. All the very best and try them once at least you will get surprised with the results. i am provide wordpress theme but my site open is load can you tell me http://www.ubaidsheikh.com/ increase speed ? Excellent article and very useful information. We can also control the post revisions by changing the value of WP_POST_REVISIONS in the wp-config.php file.